Luckily for us the Atlantic Theater extended the run of Hangmen so we had the opportunity to see Martin McDonagh’s comedic tragedy. 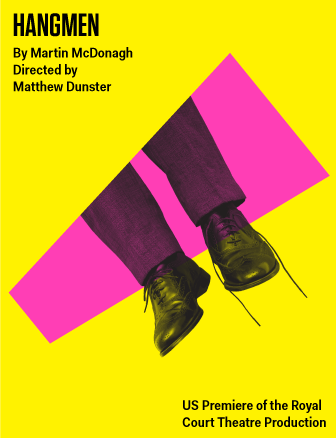 While this play may not appeal to everyone (just as McDonagh’s Three Billboards Outside Ebbing, Missouri had its share of fans and detractors) Hangmen is fun once you get into the rhythm of the regional British accents. It takes some time but is well worth the effort. The play starts with a bang. The stage floor opens and a young man proclaiming his innocence is hanged. There’s a flash forward in time and death by hanging has been abolished. Harry Wade, one of the town’s hangmen, leaves his job to embark on a new career running a pub with his wife and daughter in the British countryside. Harry has quite an ego and considers himself a local celebrity so the local sots who frequent his pub know it’s wise to appeal to his vanity – it might earn them a pint or two. But his ego gets the better of him and his simple country life changes when he is interviewed by a local newspaper reporter and when a Londoner named Mooney enters the pub looking to rent a room. This is not a play with a straight narrative and Mooney takes us and Harry’s daughter on a mysterious trip with plenty of twists.